How can I access the product from outside through WebAccess? - Details of an answer | Buffalo Inc.
How can I access the product from outside through WebAccess? How to set the WebAccess. Go to the product settings, and enable the WebAccess. Click here for the setting details. You will see the login box to the "buffalonas.com"
You will see your WebAccess status. 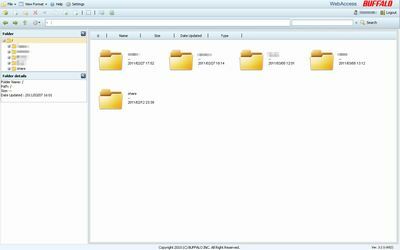 You can see the shared folders/files on internet (the ones do not have access restrictions). *You will see the image above when you access using computer. *You can go to the same page without going to "buffalonas.com"
Open http://product public IP address:port number/ on your browser.